The monumental complex of the Scuola Grande San Giovanni Evangelista is the result of centuries of architectural and decorative works. Beginning as a small, mid-fourteenth century building, it was gradually extended as the Scuola’s economic and religious importance grew. A first extension was made following the acquisition of the prestigious Relic of the Cross in 1369. 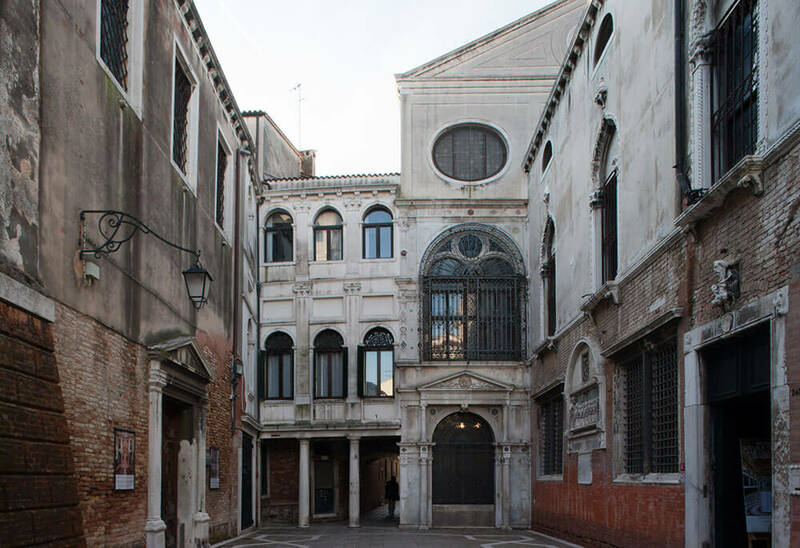 The external work by Pietro Lombardo and that of the monumental staircase, the noble access to the Chapter House, by Mauro Codussi, the leading architects of the early Venetian Renaissance, were then added to an extended building during the fifteenth century. The grandiose series of large canvas paintings with the Miracles of the Cross by Vittore Carpaccio, Gentile Bellini and others, which enhanced the decorations in the Oratory of the Cross, is from the end of the century, while Titian’s painting for the ceiling of the Albergo was painted in the mid-sixteenth century. Unfortunately these works are no longer held in the Scuola. The last, major, architectural alterations to the Chapter House and in the east and west extensions were carried out by George Massari in the first half of the eighteenth century. The campiello retains the size and position of the medieval courtyard from which it originated and has elegant paving dating from 1759. 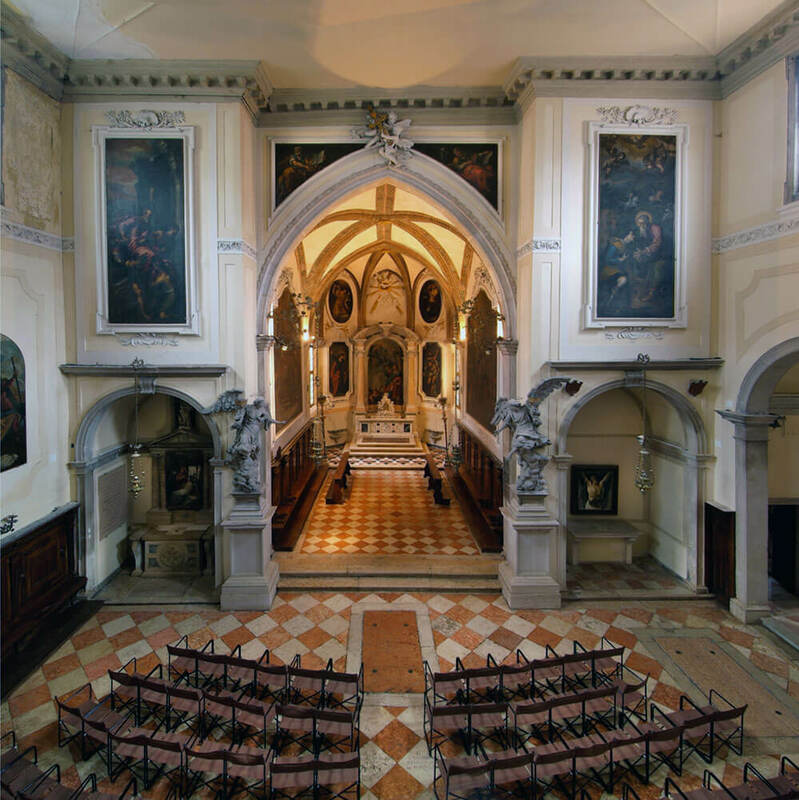 Several buildings of different styles and periods that make up the Badoer complex (the noble family whose hospitality and patronage were decisive for the development of the Scuola), the church dedicated to St John, the early cemetery and the marble screen all look onto it. The side of the Scuola building, of mainly medieval appearance, features a relief showing the brothers kneeling, with epigraphs below relating to the fourteenth-century building, and late Gothic windows from the fifteenth-century rebuilding. There is also a plaque showing the level reached by the water during the flood that struck Venice on 4 November 1966. The early Renaissance group of the double light window (1512) and the entrance to the Hall of Columns, attributed to Gentile Bellini, can be seen on the end facade of the campiello. 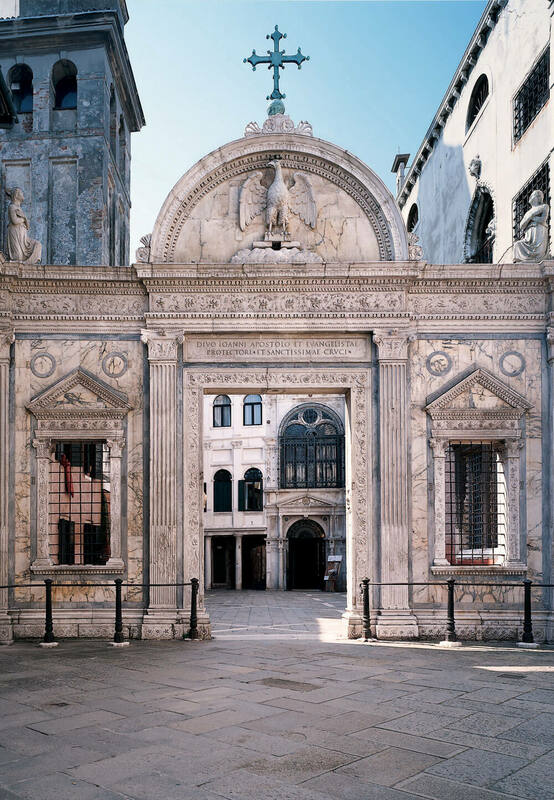 The marble screen by Pietro Lombardo (1478-1481), a very large architectural composition, is a masterpiece of Venetian Renaissance sculpture on which the symbols of the Scuola and its patron (cross, eagle and books) are clearly shown. It defines the small, separate, urban space occupied on the left by the church dedicated to St John and on the right by the Scuola itself. The first inviting room is a large atrium that is part of the renovated fifteenth-century building, of which the ceiling remains with its exposed beams and spiral perimeter decoration. It is a passage area that gives access to the various functional parts of the Scuola. The important portal to the Staircase is noteworthy, framed by two fluted pillars on which the beautiful architrave with niello decoration rests. Some testimonies to the vicissitudes of the building in the modern period are documented on the left wall, while an inscription on the right announces in vernacular Venetian the start of the ‘lavorier’, or rebuilding of the rooms, in 1349. This event and the names of those involved are carved into the stone scroll unrolled by the figures of two kneeling brothers. The bas-relief with the Resurrection, attributed to the workshop of Antonio Rizzo (15th century), was not made for the Scuola. The Hall of Columns is a vast space intended to host the brothers and pilgrims, which retains the medieval appearance of the fifteenth-century building. The five stone columns with lowered bases, decorated at the top by owl beak capitals with the figure of a cloaked brother holding the staff of St John (dated to c. 1350), support the longitudinal beam on which the ceiling beams rest. The severe walls are lightened by various openings, including the Renaissance doorway leading to the campiello, the water entrance and the portal, matching that of the atrium, leading to the eastern flight of the staircase. The little Cappella dei Morti was created in the bay of the staircase. 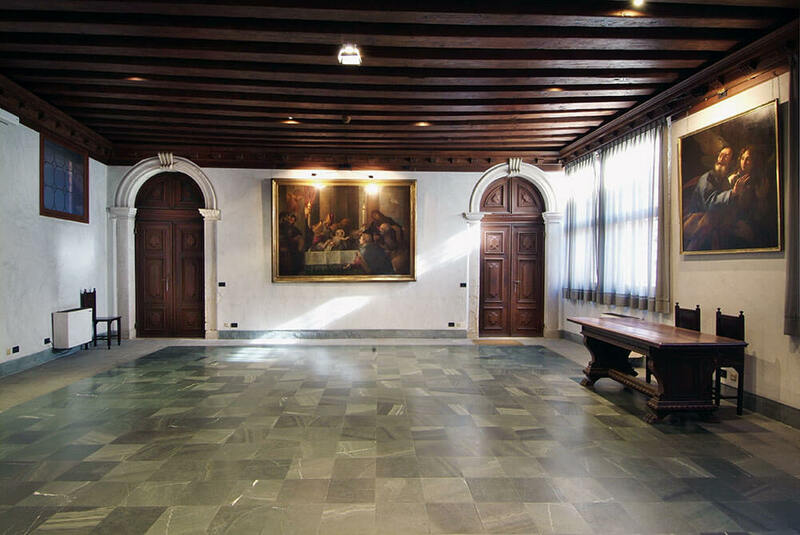 The hall was restored and made impermeable to high tides after the big flood of 1966 and is furnished with interesting stone materials, most not originally belonging to the Scuola. 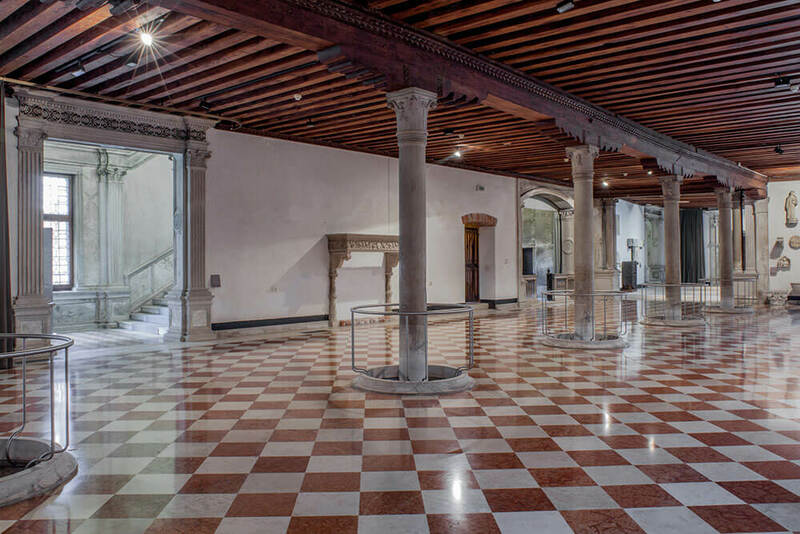 The two, wide, Renaissance portals give access from the Atrium and the Hall of Columns to the two flights of the elegant staircase, a masterpiece built by Mauro Codussi of Bergamo in 1498. Codussi (recorded in the lists of brothers as ‘Moro murer’) made extraordinarily skilled use of the narrow space allowed by the proximity of Rio di San Giovanni, clearly visible from the Hall of Columns access. The architect resolved the lack of space by adding illusory space to what is actually there. 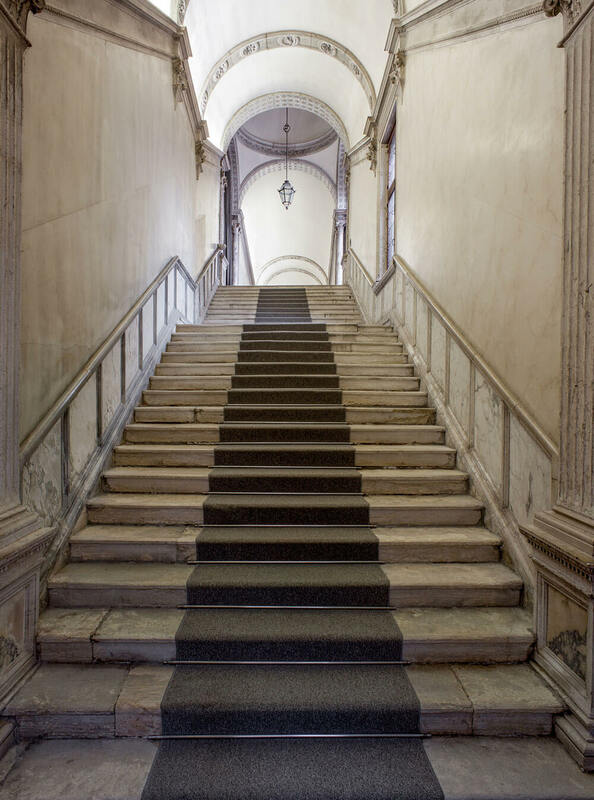 This was achieved by widening the internal walls of the staircase towards the top (the steps at the top are about seventy centimetres wider than at the base). In this way the perspective lines of the flights create the illusion of greater depth. Some other elements reinforce this distorted perception: the two spaces roofed by blind domes at the start of the flights, the landings that interrupt the flights, the side windows that accompany the ascent and the small arches on hanging capitals that mark the tunnel vaulted ceiling. 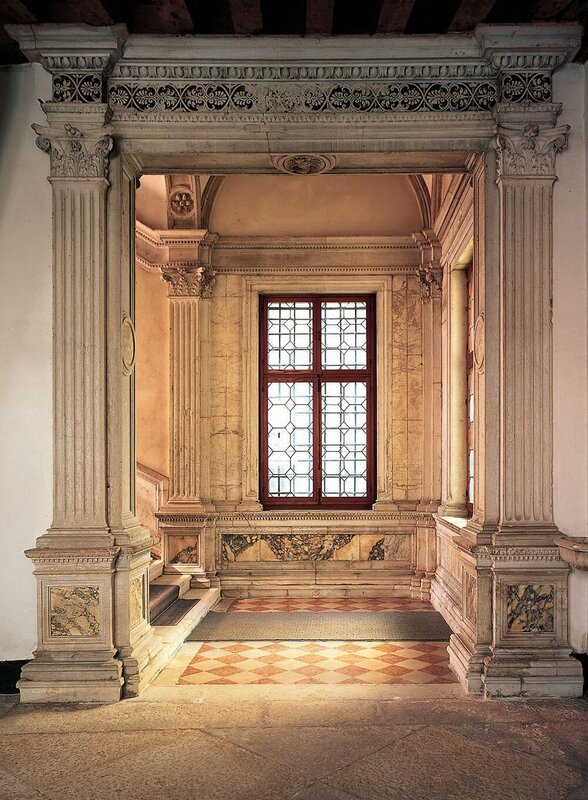 At the top of the two flights Codussi managed to create a refined anteroom for the main hall by widening the narrow usable space and covering it with a small, elegant, blind dome, which rests on a niello decorated drum, and opening four big arches embellished with Renaissance decorative elements; two towards the stairs, one for entry to the hall and one crowning a large double window with round arches and central eye – an authentic ‘trademark’ of Codussi’s buildings. 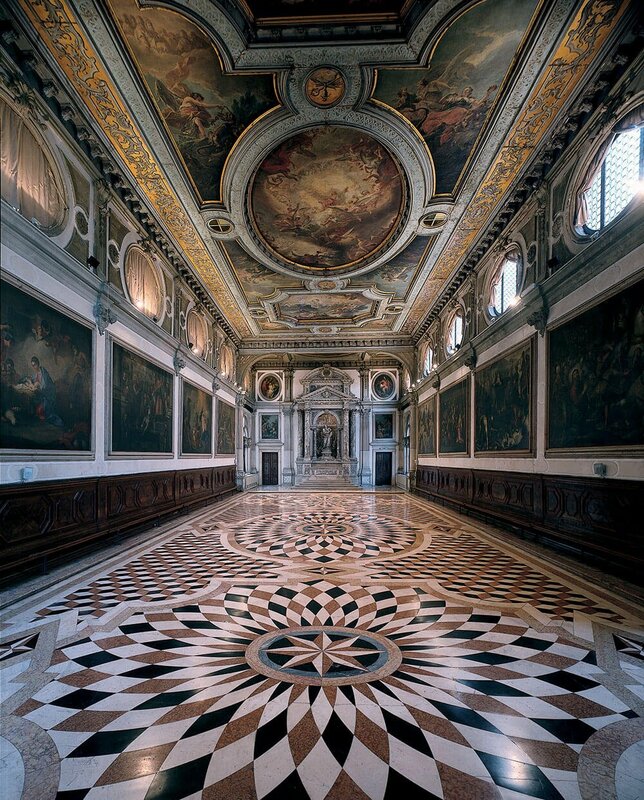 This very striking, elegant and well-lit room, intended to host the general assembly of the brothers, was created under the direction of Giorgio Massari between 1727 and 1762 from the old fifteenth-century hall. The previous wooden ceiling, decorated in gold and blue, was raised five metres and twelve large oval windows then opened up. These capture the light from above the surrounding roofs and let it fall in bands onto the floor, an absolute masterpiece of white, red and black marble woven into geometrical oval and star shapes. They are marked out into three big roses enclosed in a two-colour ribbon, a motif that also decorates the contemporary wooden benches against the walls. The altar dedicated to the patron saint against the end wall, replacing a previous one in wood, is a work of considerable proportions in light marble with grey veins, designed by Massari in 1728. The niche in the centre contains the statue of St John the Evangelist in the act of writing his Gospel, accompanied by the eagle and a cherub, symbol of divine inspiration, by Giovanni Maria Morlaiter (1732-1733). Most of the paintings on the walls illustrate episodes from the life of St John the Evangelist according to the Golden Legend by Jacopo da Varagine, while on the ceiling there is an eighteenth-century cycle of scenes taken from the book of Revelations, another work written by the author of the fourth Gospel. 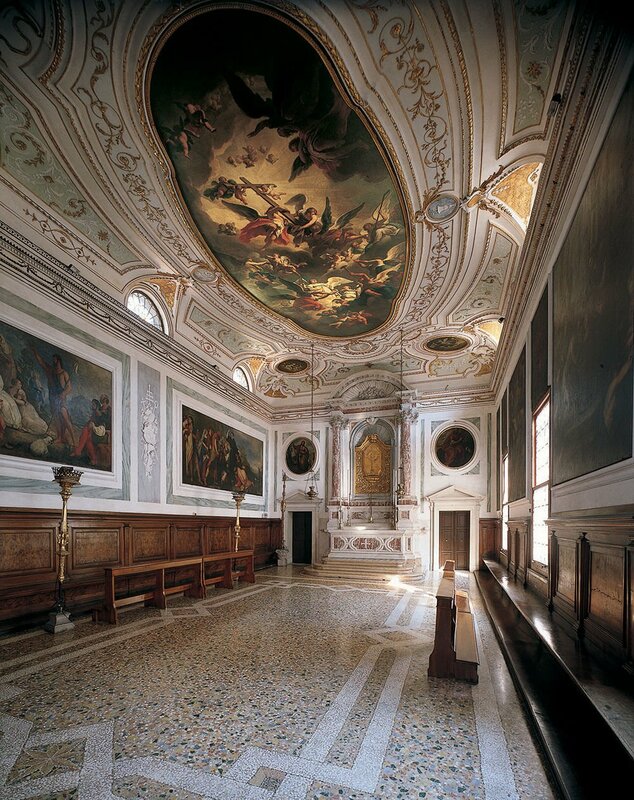 The more significant ceiling paintings include two corner compartments by Giandomenico Tiepolo. The Chancellery, created in 1757 to support the Chapter House, is a bright, private room with three doors and three windows. Entirely decorated with elegant stuccoes by the Ticino masters Antonio Adami and Francesco Re, it retains the enchantment of eighteenth-century Venice. 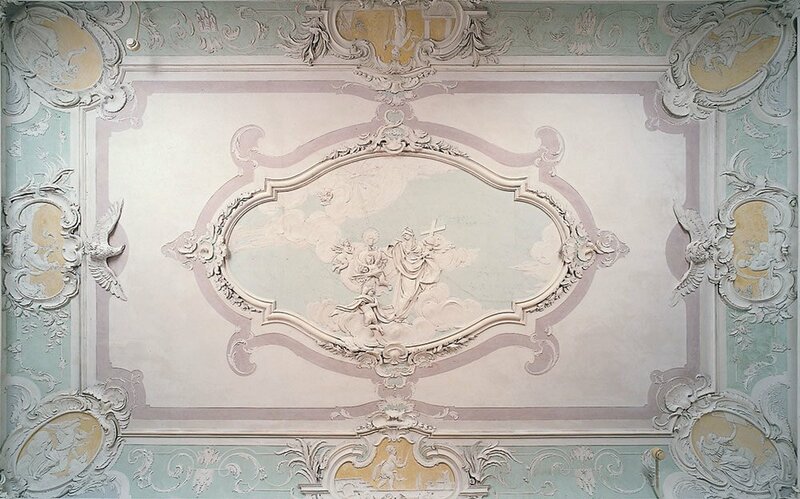 White figures and decorations are interwoven on the walls and ceiling against backgrounds of delicate pink, grey-blue and fig-green pastel shades, typical of Venetian Rococo. The decorations are concentrated mainly on the high cavetto mouldings (between cornice and ceiling) where the four corners and the middle-lines are inserted on the overdoors; the ceilings are characterised by a large central oval with theatrical allegories inspired by the love of space and perspective tricks of the great Venetian painting tradition; the whole is completed by sober coloured fields framed by bands with slightly projecting friezes on the walls. The room is further distinguished by an iconographic programme all in all referring to an ideal of administrative virtue. This room contains a reduced scale photographic reproduction of the famous cycle of large canvases on the Miracles of the Cross (1494-1501), formerly in the Oratory of the Cross and now in the Gallerie dell’Accademia: Offering of the Relic to the Scuola di San Giovanni Evangelista (Lazzaro Bastiani), Miracle at the Rialto Bridge (Vittore Carpaccio), Miracle at the San Lorenzo Bridge (Gentile Bellini), Miracle of the Merchant Jacopo de’ Salis during the Procession of St Mark (Gentile Bellini), Miracle of Pietro de’ Ludovici (Gentile Bellini), Miracle in Campo San Lio (Giovanni Mansueti), Miracle of the Daughter of Benvegnudo da San Polo (Giovanni Mansueti), Miracle of the Son of Ser Alvise Finetti (Benedetto Rusconi called Diana). The superb, Gothic, rock crystal and gilt silver reliquary containing two fragments of the Cross on which Jesus died, in the case at its top, is held in the altar tabernacle in this elegant chapel – also modified in the eighteenth-century restorations. The relic was donated to the Scuola in 1369 by the French knight Philippe de Mezières, Grand Chancellor of the Order of Cyprus and Jerusalem and has always been especially worshipped by the brothers. 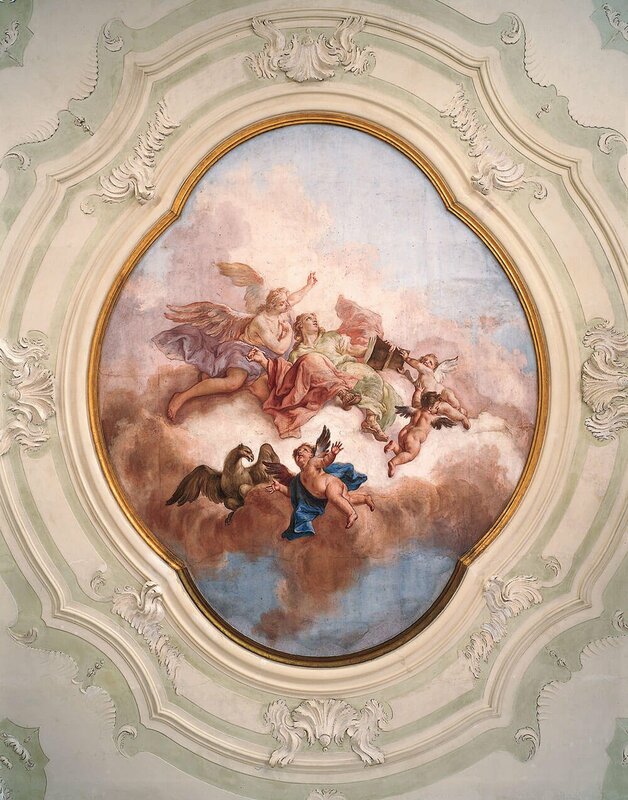 The decoration of the eighteenth-century ceiling is interesting: stuccos of delicate green, light blue and pink pastel highlighted by extensive gilding surround the central canvas with the Triumph of the Cross by Francesco Maggiotto (1784 – 1788). The symbols of St John appear inside the small blue tondi: the eagle, the staff and the poisoned chalice, which according to apocryphal stories the saint drank without harm. The canvases on the walls, partly of external origin, replace the fifteenth-century cycle with the Miracles of the Cross, now in the Gallerie dell’Accademia. The Oratory of the Cross leads on to the Albergo, as the room for the meetings of the governing bodies of the Scuola (Banca and Zonta) was called. The small square room – not part of the eighteenth-century works – retains its severe, sixteenth-century appearance, with wooden dossals on the walls decorated with simple geometrical inlays surrounded by superb decoration. Four impressive paintings depicting Episodes of the Apocalypse by Palma Giovane (1581-1582) are all that remain of an iconographic programme from the second half of the sixteenth century. This began on the ceiling (now removed) with Titian’s splendid painting of the Vision of St John in Patmos in a gilt frame. There is an interesting panel on the right wall with a Madonna Platytera and Saints, from the fourteenth century. Another room was added on completion of the eighteenth-century works for the Scuola’s administrative work (accessed from the Albergo, across the landing). 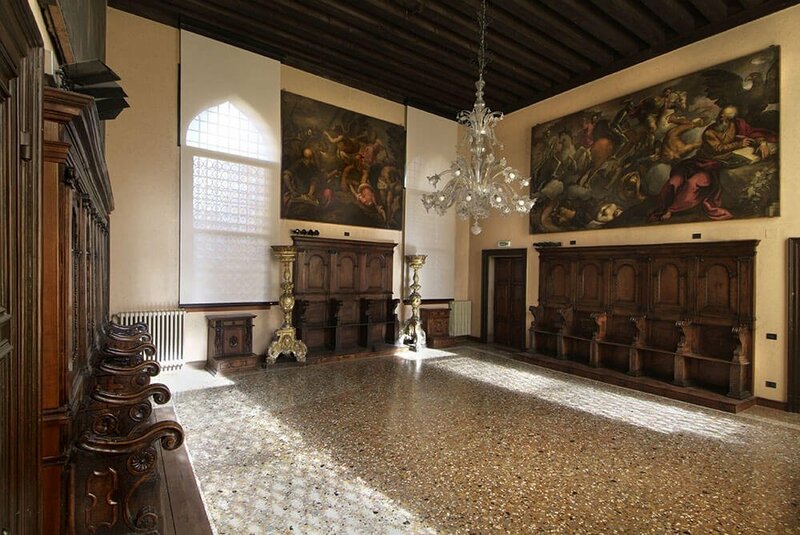 Previously known as the Archive and Council Room, it is now named after Jacopo Guarana, to whom the frescoes on the ceiling and above the doors are attributed. In an airy combination with the stuccoes, these frescoes on planks of wood (a technique typical of the late eighteenth century) offer a further variant of the decorative style of the time: after the ‘complete’ stuccoes in the Chancellery and the Sacristy, and the solution in the Oratory with canvases and stuccoes, this room, too, presents the elegance and lightness of oval lines and pale colours. In the large, frescoed tondo in the middle of the ceiling, St John the Evangelist in the act of writing the Gospel is surrounded by three putti and an angel along with the eagle. The symbols of the Scuola appear in white stuccoes on gilt ovals: from the entrance, in anti-clockwise direction, the chalice with serpent, the staff, the eagle with books and the cross-reliquary. At the corners, four more white ovals contain female figures, allegories of the virtues necessary for those who administered the Scuola: Prudence, with the serpent and mirror, Justice, with the sword and scales; Temperance, with the putto holding a vase from which water flows, and Fortitude, with a branch and a crown of oak leaves, accompanied by a lion. On the three frescoed overdoors, Consilium, Concordia and Diligentia, identified by the respective scrolls, complete the ideal of good government that had guided the ancient brotherhood for more than five centuries. The Green Room, next to the main entrance, is now the ticket office and bookshop. Restored at the beginning of the 1990s, it has a noble and welcoming appearance thanks to the green shade of the slate flooring, and the ceiling with its now exposed, sixteenth-century beams. There are some paintings on the walls that were donated by brothers: the Presentation of Jesus at the Temple, attributed to the workshop of Palma Giovane, a Portrait of the Guardian Grande Andrea Vendramin and the Appearance of the Angel to St Peter, by unknown artists. Set in a fabric of ancient urban formation, the church was founded in 960 by the Badoer family, who retained its ownership along with the exclusive right to bury the members of its family there. The church was granted in use to the Scuola Grande San Giovanni Evangelista in 1301 for the needs of the brothers to perform their religious rites in a place near their own premises, on condition they paid the household a fee for carrying out any maintenance works, though obtaining the privilege of burial in the adjacent cemetery. In 1441 the Scuola Grande set aside money for the construction of a chapel, which was to become the current chancel with elegant groin vault, enhanced by a raceme decoration. The works at the end of the sixteenth century gave a further, east-west, longitudinal development and the definitive plan of the church with the opening of the side chapels. But it was from 1758 that important restoration works were carried out by Bernardino Maccaruzzi, proto of the Scuola Grande and pupil of Giorgio Massari, who designed the monumental structure of the choir housing the organ. The latter, made by the famous organ maker Giovanni Battista Piaggia, is dated 1760 and still has its original, perfectly functioning bellows. The church was expropriated by the state after the Napoleonic decree of 1806 and reopened only in 1822. In 1931 it was granted in permanent use to the Scuola Grande San Giovanni Evangelista and is still consecrated. The church now has a single, more or less square nave, with flat ceiling and polygon apse preceded by the chancel, beyond which there are two minor chapels on left and right; on the south side there are two main chapels (San Donato on the left and Lourdes on the right) and the sacristy, accessible from the chapel of San Donato. On the west wall, opposite that of the apse, stands the organ and a doorway leading to the former cemetery next door (now named the Badoer Exhibition Space). The Three Moments of the Passion, by Lamberto Sustris (in the sacristy).